The next book in The Lost Elf series is now available to pre-order at amazon.com. Click here! This is the first time I have used the pre-order option through Kindle Direct Publishing, so exciting! I’m happy to be publishing this book now. It’s been over a year since Reptilian Encounter was released. Too long, something I hope not to repeat. I’m close to the middle of the series now! Princess Tom is coming along pretty well. Actually, it’s longer than I anticipated, not a bad thing at all. It’s just kind of surprised me. I’m really enjoying it, especially the narrator 😉 Originally it was to be a short story, but I’ve surpassed the that point. It’s now at the novella length! I could see this story becoming a novel, but I’ll follow the story for as long as necessary. 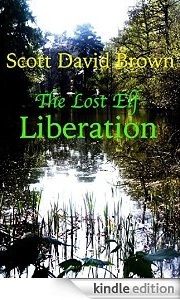 Anyway, The Lost Elf: Liberation will be available for purchase on Wednesday 22, just in time for Earth Day. If you don’t have the first two books, you can download them for free on kindle starting today through the 22nd. Liberation will be .99 cents, so you can pick up the first three books of The Lost Elf for under a buck! Or would you prefer me to say, almost a buck? Next Next post: It’s Earth Day!